Today's Reader Spotlight is on - Soomya. She is my stylish and super supportive sister-in-law (husband's cousin). Thank You, Soms for being such a sport and always saying the kindest things. I had a fun time putting this outfit together for a Dinner with my friends. Since it was cold and dark here in Delhi (December 2011) and I hate wearing black and grey, I decided to play with polka dots. As Tanvi has often suggested, I picked one piece from my closet and planned the outfit around it. 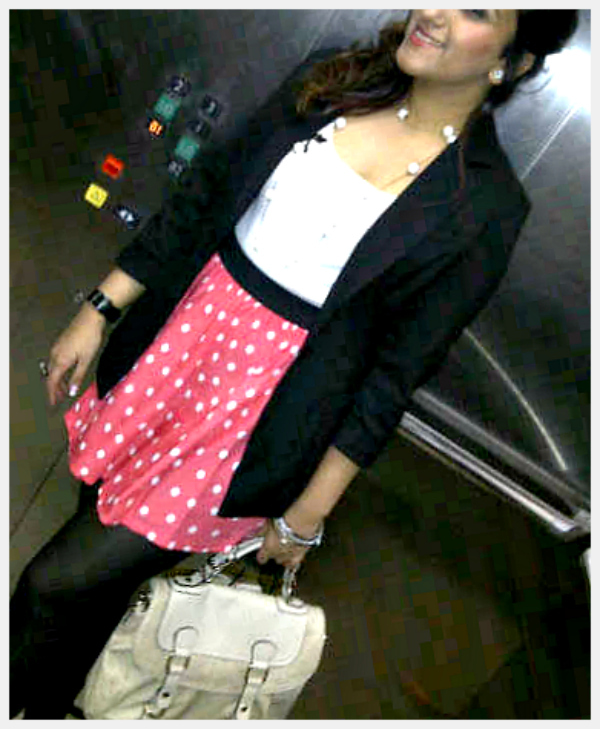 I picked the polka dot skirt and paired it with black leggings and a black dinner jacket. I wore a neutral color like white in between to avoid the overdose of pink. I added the finishing touches to the outfit with a string of pearls, lots of bangles (obsessed with them) and black watch. The inspiration of wearing a white tank with a black net patch came from this post, however, the outfit is loosely inspired from this post. P.S. I am completely in awe of TANVI not just because we are related but for her classic, fun and very inspirational style! I think it is a super cute look. I love the finishing touches. And let's not forget the satchel which is playing an amazing contrast against the pink skirt. There is nothing like brightening up the cold & dull winter evenings with some bright colors. Whats your verdict people? P.S. Genuine feedback is welcome, nasty criticism is not. If you have been inspired by my blog and wish to share your outfit with everyone feel free to email me your photo. If you do not wish for your name to be revealed, you can choose to stay Anonymous. I think the pink polka dotted skirt is too cute for words, also love how it matches with her lip color! Cute!!! Love the pop of colour!!! Somya is looking pretty and classy ! the dash of pink in an all black and white outfit + bag is sure to attract anyone's attention ! Tanvii, can't wait to send my photos soon ! Love the skirt! Very cute look. She has great style! I love her pink polka dot skirt! U have a stylish family!! Nice outfit and glad u have such a supportive sis-in-law. I always end up wearing, blue, black, blue black. She looks amazing! I've always loved polka dots but didn't wear it too often as I was afraid it's make me look too girlie.But she added the otherwise not-so-girlie colors to create a great look!I love her satchel too!Would have loved to have a full-length picture though.Didn't get to see her shoes.What was she wearing anyway? How cute is she?!! I love her polka dots and satchel! very cute skirt and love the outfit,very stylish yet chic.. I love readers spotlight. She looks lovely! her skirt is really cute. i see you gals are a stylish family! I think she looks adorable, and I really like that you featured family! The skirt...the satchel...Dying over them both! that skirt is SO CUTE!! Do like the way the whole outfit's played out...a bit of matching and a bit of contrast! The whole outfit is so cute, and chic. Did I say I LOVE this series?